With the Ontario election only a few short days away, the President of the Ontario Nurses’ Association, Vicki McKenna, has written an open letter to Progressive Conservative Leader Doug Ford. Ontario nurses are calling on Ford to divulge the details of his Party’s proposal to find efficiencies. Ontario nurses feel we can no longer stay silent about the Progressive Conservative (PC) Party’s lack of a full health care platform and your proposal to find ‘efficiencies’ in government spending. As advocates for our patients, nurses know that cutting 4 cents of every dollar spent by government will mean at least $6 billion in cuts. Because health care funding amounts to 42 percent of government spending and due to the absence of details about your plans, we have to assume this means your proposal to find ‘efficiencies’ will result in $2.5 billion cut from health care spending. Cutting $2.5 billion in health care spending is equal to cutting 25,000 Registered Nurses from the bedside. 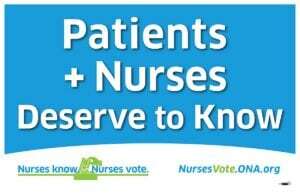 To read the full letter, visit nursesvote.ona.org.